Kingdom Tower that is being built in Saudi Ara­bia is all set to become the first skyscraper ever to break the magic barrier of 1,000-meters. The construction of the building began March this year and is due to be completed in 2018. 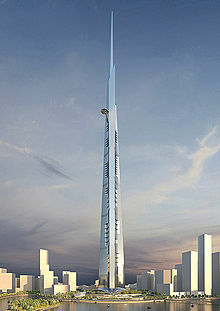 The skyscraper will then tower ov­er even the wor­ld’s current tallest building, Burj Kh­alifa, Emp­oris reported. At 636 meters, the Wu­han Greenland Center is third in the list of the world-beaters of the fut­ure, closely followed by Shanghai Tower, which is only 4 meters shorter. Having recently reached its full height of 632 met­ers, the latter is already celebrated as China’s tall­est building; when finally co­m­pleted next year, its 121 floors will house office sp­ace and a luxury hotel. In the US, there is only one skyscraper under construction able to even partly compete with the giants from the Far and Middle East, and that is the 541 meter tall One World Trade Center in New York, due to be completed this year. Even now back in seventh place on the under-construction list, in a few years’ time the one-time world-leading skyscraper power U.S.A. will no lon­ger have even a single en­try among the Top Ten tallest buildings in the world. A source of particular excitement in recent we­eks was the Chinese skyscraper project Sky City, located in Changsha. At 838 meters in height, the tower is projected to be 10 meters taller than Burj Khalifa. A construction time of ten months would also make it the fastest-built skyscraper in the world. Whether the ambitious mega-project will tru­ly see the light of day in 2014 as planned, is currently debatable. According to media rep­orts, construction work was halted only a few days after the foundation stone was laid.